ChandlerpediA is your one stop online place to learn about all things Chandler! You can browse photos, documents, oral histories, and stories from the collection of the Chandler Museum. You can also explore the city's first newspaper, the Chandler Arizonan, published from 1912 to 1986. Check out our online exhibits, too! 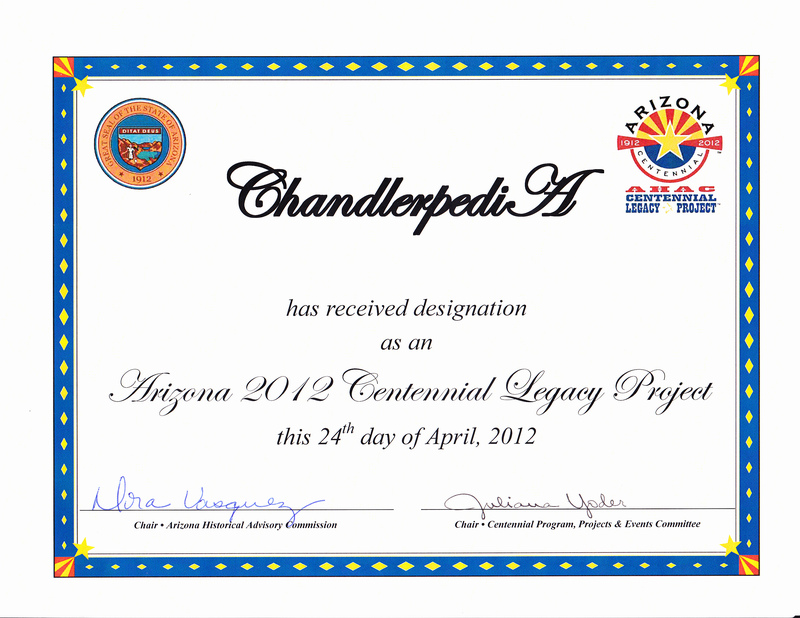 On April 24, 2012 ChandlerpediA was designated as an Arizona 2012 Centennial Legacy Project. "Legacy Projects involve community-wide collaboration and demonstrate the vitality, quality and diversity of Arizona. These projects will help to establish a lasting legacy well into the next century. The scope of projects will enhance teaching and learning about Arizona's history with new content from accurate, original research."